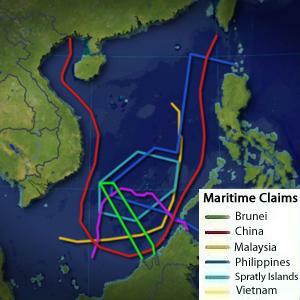 The South China Sea functions as the throat of the Western Pacific and Indian Oceans – a mass of connective economic tissue where global sea routes coalesce, accounting for $1.2 billion in U.S. trade annually. It is the demographic hub of the 21st-century global economy, where 1.5 billion Chinese, nearly 600 million Southeast Asians and 1.3 billion inhabitants of the Indian subcontinent move vital resources and exchange goods across the region and around the globe. It is an area where more than a half-dozen countries have overlapping territorial claims over a seabed with proven oil reserves of seven billion barrels as well as an estimated 900 trillion cubic feet of natural gas. On top of this, sovereignty over parts of the South China Sea is contested by a number of countries, including China, Brunei, the Philippines, Malaysia, Taiwan and Vietnam. In other words, geopolitically speaking, this place is no joke. It follows that any instability, or significant change, in the region is and will be of real concern to the United States and its allies. On energy, Will highlights how increases in droughts precipitated by climate change can lead to reduced hydroelectric productivity in China, which could in turn increase the incentive for China to explore fossil fuels under the South China Sea floor, including in contested areas. In all, a good read on a topic that is of significant importance to the U.S. from a security perspective. Particularly as the Obama Administration continues to place a strong emphasis on the Pacific in its recently unveiled defense strategy. This is a space worth watching closely. By Francesco Femia & Caitlin Werrell in accelerant of instability, Brunei, Center for a New American Security, China, climate change, conflict, dam, disaster, drought, energy, energy security, Malaysia, national security, oil, Philippines, security, South China Sea, Taiwan, United States, Vietnam, water, Will Rogers on January 9, 2012 .